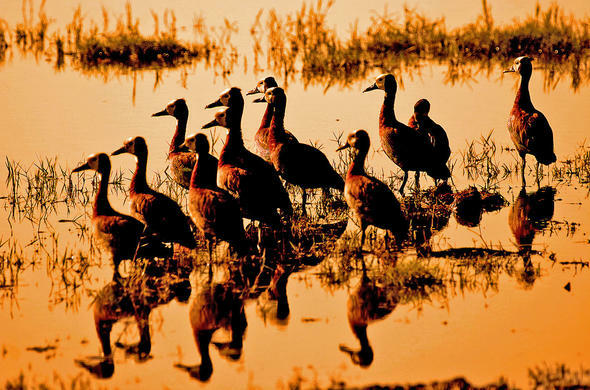 A safari in the Okavango Panhadle region is more about the tranquility and scenery than a big game viewing safari experience, and more and more people are discovering the charms of this un-spoilt region. Although the Okavango Delta Panhandle is not a renowned game viewing destination, you may encounter smaller herds of Lechwe which are more suited for this terrain. Hippo and Crocodile sightings are very common. The Okavango Panhandle has become famous amongst birders and over 350 species have been recorded within the deep-water channels and lagoons.Due to the fact that the Panhandle area is characterized by such deep water channels, the most common form of plant life that exists in the area is papyrus. There are exceptions with this environment but mainly the vegetation here is huge expanses of floating papyrus. The birdlife here is varied and some of the more sought-after sightings such as the Rufous-bellied herons, Lesser jacanas, Brown-throated weavers and Painted Snipes, can be found in and amongst the vast masses of papyrus. The Panhandle area is a particularly good for sightings of the the White-backed night heron as well as the African Skimmer which is one of the main attractions. One of the most marvelous sights of the Panhandle Region is to watch these birds feed. Skimmers have an elongated lower mandible and as they swoop gracefully over the water, they drop the angular and sharp lower part of their beaks into water. As soon as they are able to get hold of any type of food they then swoop back upward, trapping their prey. Another wonderfully colourful attraction which is better represented in the Panhandle than anywhere else in the Delta, is the Carmine bee-eater. These migrate to southern Africa to breed from about October to March. Bee Eaters tend to nest in large colonies, building their nests underground by digging into the side of sandy riverbanks. The sight of flocks of these brightly coloured pink birds swarming around their riverbank nests, is quite a sight to behold.